It didn’t matter who won the 2011 Women’s World Cup final, the winner already had a title. 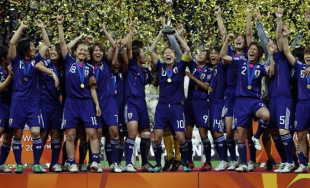 Japan was the Team of Destiny that brought joy to their nation after a devastating tragedy. The US overcame odds—leading up to and then throughout the tournament—to improbably reach the finals. But much to the dismay of American fans, it was Japan that came out on top. The Japanese outscored the Americans 3-1 on penalty kicks after the teams played to a 2-2 draw through extra time. US Coach Pia Sundhage featured a new starting lineup in the final, making her first change up top since before the World Cup. Philadelphia Independence striker Amy Rodriguez was benched in favor of Megan Rapinoe, who started out wide, with Lauren Cheney pushed up to striker. The US played arguably their best half of the tournament to open the final. Carli Lloyd and Shannon Boxx looked comfortable together in the midfield and limited Japan’s possession. The US was able to get off a number of shots, although very few of them found the frame. Cheney played well up top, working well with Abby Wambach. They offered attacking runs down the wing, but for some reason both Rapinoe and Cheney chose to shoot the ball from a terrible near post angles rather than lay off for a teammate. When the ball was laid off, the Americans couldn’t seem to hit the net. The US took a step back in the second half. They had fewer dangerous chances, and a series of silly giveaways led to some threatening opportunities for the Japanese. Luckily, Hope Solo and Christie Rampone were always there to clean up in the first 20 minutes of the second half. Halftime sub Alex Morgan (on for an injured Cheney) played well, and notched the game’s first goal in the 69th minute. Rapinoe played a ball over the top and Morgan was able to hold off and outrun three defenders before hitting a great left-footed shot low into the far post corner. With the Japanese still struggling to create some dangerous chances, it looked like the Americans would be able to ride out the final 20 minutes. However a defensive breakdown in the 80th minute let Japan back into the game. Rachel Buehler was unable to clear a cross first time, and instead of kicking the ball out of bounds, she tried to clear it through the middle. Unfortunately, it knocked into Ali Krieger, and the deflection landed at the feet of Aya Miyama, who was not going to miss from 8 yards out. The Americans created numerous chances during extra time, and were knocking on the door throughout the first 15 minutes. In the 104th, Alex Morgan took the ball to the endline, and put a hard cross onto Abby Wambach’s head at the six yard line. Wambach did what she does best and buried the header in the back of the net with aplomb. Once again, it looked like the US had the game in hand. However they were unable to get an insurance goal, and that would come back to haunt them. The Japanese earned a corner kick in the 117th minute. Captain Homare Sawa deflected the near post cross on frame, sneaking it past Hope Solo to tie the game. The US shot first in PKs, and hoped to put pressure on the Japanese kickers. This was eerily similar to 1999, and one would think the US had the advantage, considering they already had one PK win in the tournament. Shannon Boxx led off the PKs, but her shot to the right side was saved by Japanese keeper Kaihori. Japan’s first kicker, Miyama, put her team up a goal. The US has Hope Solo, so going down one PK is not the end of the world. The second American kicker Carli Lloyd put her shot over the crossbar. Hope Solo kept the US in it with a save on Nagasato’s PK, but US substitute Tobin Heath took her country’s third kick and Kaihori made an easy save to the left side, leaving the US with their backs against the wall. Solo nearly had the shot by Japan’s third kicker, Sakaguchi, but the powerful strike skipped under the keeper’s outstretched glove. Wambach was the fourth shooter for the US and the first to score. She blasted her shot straight into the back of the net. If nothing else, you had to know that the US would not lose on Wambach’s shot. But Solo was unable to produce magic, and Japanese defender Kumagai put the ball past her to give Japan their first ever World Cup title. With that, the Japanese were off to their celebrations and the Americans were left dazed and confused. There will be lots of talk as to what went wrong, but truthfully, it comes down to closing out games. The Americans were the better team on Sunday but they did not capitalize on enough opportunities to put the game out of reach. We had the lead twice… We blew it. Japan deserved the W.
The result’s too bad, but I think that match was infinitely more exciting than the men’s World Cup final, even beyond the fact that we were involved in this one. I’m with you Joe, the WWC final was much more exciting than the WC final, USA involved or not. How refreshing was the absence of diving, dirty play, crappy gamesmanship, refereeing getting in (or out of) the way, and so on. I’m gutted that the US lost, but they were fairly beaten on their faults. Nothing to complain about there.